Congratulations on your engagement! This is such an exciting time in life, so don’t be afraid to enjoy every last second of it. From finding the perfect venue, coming up with cute bridesmaid proposals, and creating a wedding registry with your fiancé to picking out your dream wedding dress, there is so much to be excited about as you plan your special day. Yet, with so many decisions to make, it can be easy to put off the finer details like making arrangements to get your hair and nails done, your eyelash extensions filled, your bikini line waxed, and your skin bronzed with a fresh airbrush tan. From all of us at Celebrity Skin Couture Air Tan in Chicago and Wilmette, IL, here are some tips for getting the perfect airbrush spray tan for your wedding day! Airbrush spray tans, like any other method of sunless tanning, vary from person to person based on skin type, activity level, the quality of service, and a range of other factors, which can make it difficult to predict what your spray tan will look like when you visit a tanning salon. Because of this, our technicians recommend booking a trial run a few weeks before your big day so you know exactly what to expect in terms of spray tan preparation and maintenance, as well as your ideal spray tan shade. This way, you’ll be less nervous about the outcome when you visit our Chicago tanning salon for your pre-wedding appointment! Perhaps the most critical tip to ensure that you get the best spray tan possible for your wedding day is to follow the spray tan preparation and maintenance instructions provided by your tanning salon. For example, at Celebrity Skin Couture Air Tan, we encourage clients to shower, shave, and thoroughly exfoliate their skin prior to arriving for their spray tan appointment, as this leaves the skin soft, smooth, and ready to fully absorb the organic tan. We also recommend that clients have any manicures, pedicures, and waxing done several days before their airbrush tan appointment, as neglecting to do so can cause the tan to fade quicker in certain areas. For best airbrush tan results, have these things done before your appointment and arrive in loose-fitting clothing to minimize any rub-off. Once your spray tan has been applied, it’s up to you to make it last until your wedding day. Don’t worry, though, maintaining an airbrush tan is easy if you follow the spray tan aftercare instructions provided by your technician. Ideally, airbrush spray tans last up to 10 days after your appointment, so if you follow these tips, you should keep that beautiful bronzed look through your honeymoon! After the airbrush tan treatment, wait at least eight hours before showering so the airbrush tanning solution has time to fully soak into your skin. Also, don’t take scorching hot showers and exfoliating, as this can cause the tan to wear off sooner than you want. When you’re done showering, pat yourself dry instead of rubbing your skin with a towel, and don’t forget to moisturize your skin with a mild, unscented body lotion to lock in the hydration. While it might seem difficult, especially if you’re trying to tone up for your wedding dress, try not to exercise, sweat, or expose your skin to chlorine before your wedding day because this can cause the spray tan to wear off or fade unevenly. At the end of the day, what really matters is that you look and feel your best while standing in front of your friends and family as you marry the love of your life. You deserve to feel your most beautiful on your wedding day, so once all the appointments and treatments are over, take a deep breath, relax, and have confidence as you walk up to the altar! Enjoy the moment and soak it all in because you’ll want to look back on this day for years to come. 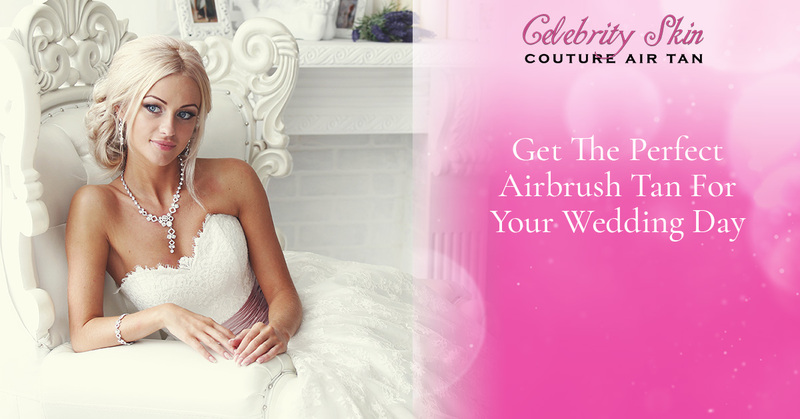 If you’re interested in getting a natural airbrush tan before your wedding day, book your appointment at Celebrity Skin Couture Air Tan in Wilmette or Chicago today. We would love to pamper you and help you get the best airbrush tan for your big day!